On W. Broadway between Blenheim and Trutch is where EAST IS EAST sits along side Silk And Spice. Both are owned by the same people and share a few hand crafted benches and tables out front for sunny days and doorway inside for the wet days. after being introduced to East is East last winter by a good friend for their chai tea, i have been frequenting this spot (also their other location on Main st & 28th) on a weekly basis ever since. you can choose out of 3 house Chai Teas (Black, Soy & Green), all are made with a secret recipe. for drinks they also have great fruit smoothies and eastern influenced shakes with interesting recipes. they also serve great Eastern style Rotis served with the best lentil soup. this time i got the Green Chai with a single Lion of the Desert roti (peas, paneer cheese and potato). 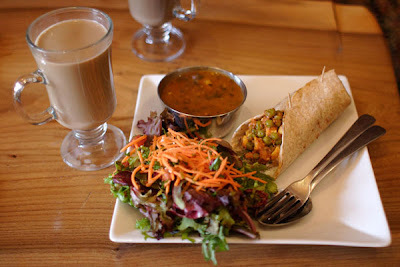 not the cheapest in price but for an original chai tea that can't be beat with an all organic ingredient roti with salad and soup, $16 isn't too bad. as long as you're not allergic to hippies, East is East serves the best chai tea in town and some very tasty roti. After reading VIA's blog on this restaurant, I immediately searched Vancouver Slop. This place looks interesting, I can't wait to check it out.